The reader is also referred to the interview with Dr Juan Almendares in the Honduras section of the Interviews page. 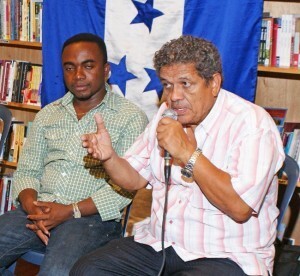 Let us defend the right to land of the peasants of Aguán and the National Front of Popular Resistance in Honduras. My grandmother used to say that the umbilical cord is always buried in some place and that my mother buried my umbilical cord in the roots of Ceiba, because this tree represents the unity of Mother Earth with the heavens. I learned the first lessons inside my mother when she was pregnant through the pedagogy of dreams, based in three principles: an intimate love for Mother Earth and for humanity, telling the truth and respecting dignity and life. I grew up watching my mother pedal day and night on a sewing machine to make shirts for a factory that exploited her without minimal labour rights. We were “those from below” the railway, where poverty, brothels, alcoholism and violence proliferated. 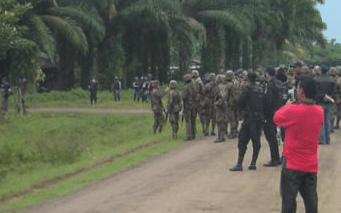 On the weekends the “campeños” – agricultural workers from the banana companies – would come to get drunk and attack each other with their machetes. It was a form of self destruction and of taking out their impotence against the power of the US banana companies. When I was eight years old, at three in the morning I went with my mother to see the almost decapitated body of my father, who was killed by a hired assassin to take away a piece of land. There were seven of us brothers and sisters, we learned from that not to have hate or vengeance, nor violence or consumption of drugs and alcohol. A tropical storm came and we lost everything including our own house. In my years as a secondary student I met the peasant Chepe Campos, of Salvadoran origin, who had migrated to the city because of poverty. He was a bricklayer; we worked together on the dream of organizing a bricklayers’ union. The project didn’t get finished because of the repressive anti-union forces and because of the flooding that destroyed the brick yards. The other teacher was Cristóbal, a shoemaker from the neighbourhood with whom we would talk about social injustice. When I was studying in secondary school at the José Trinidad Reyes Institute I met a Guatemalan peasant who was an agricultural worker for the banana companies. He explained to us with extreme wisdom the painful experiences of being exploited by those companies. We suffered hunger, humiliations and poverty to be able to study medicine. I worked with one main idea: to serve the poor, the peasants, workers, original peoples, Garífunas and students. I carried out post-grad studies in medicine in the United States. The peace movement of the US youth against the war in Vietnam, Martin Luther King, Malcolm X and Gandhi were inspiration for my position against militarism, torture and structural violence. Nonetheless I came to the understanding that the essence of capitalism is anti-human and racist, that in its bosom is engendered the process of qualitative transformation of humanity itself and that we can’t be indifferent nor neutral but have to take a position against injustice, war and the violation of human rights. I never wanted to stay in the north, even when I was condemned in Honduras by the death squads and the Argentinean Anti-Communist Alliance (Triple A). I have been a victim of the policy of the “three t’s”: trauma, torture and terror. This has not made it possible for me to hate any of my adversaries nor detractors. I start from the principle that the life of every being on the planet should be preserved and that this principle should be defended everywhere. That is why I have the firm conviction of not being racist, classist, sexist, homophobic, a participant in patriarchy nor authoritarianism; but I can’t keep silent before the crimes and lies of the military geopolitics of international financial capitalism, articulated with the oligarchic power and the ideology of neoliberalism. In essence, I am anti-imperialist. I have the firm conviction that without local, regional and global solidarity and vice versa the substantial transformations in the bosom of humanity will never be made. With this preamble of my life I want to respectfully invite the nice readers, friends of life and of Mother Earth to move your consciousness to protest against the injustice happening in Honduras and Meso-America and the plans of war against the peoples of the ALBA [Bolivarian Alternative of the Americas] and Our America. I have served as a doctor with profound love for the poor and the condemned of the earth who live in the world of injustice. I express my testimony of solidarity against the unjust conditions lived in by the Lenca people, where the oligarchy took ownership of the rivers and wants to build in San Francisco de Opalaca a dam to change the course of the waters and generate electricity for their multinational projects. Nonetheless the Lenca people are enlightened; they reject the shady light of corruption that make vulnerable the life of the rivers and of the forest; and they join in with the National Front of Popular Resistance to participate in the Re-foundation of Honduras and install the National Constitutional Assembly which takes a step towards a Constitution for everybody. When I examine the original and peasant peoples I observe the infamous process of social injustice that forces beings into autophagy (eating oneself). The boys and girls have sad, anaemic, dry eyes, with their bellies bulging and full of parasites, bare-foot, emaciated and swollen because of pain. This horrendous reality doesn’t just move me and make me cry, but my consciousness acquires a greater commitment with the people in resistance. Some years ago I presented my testimony of solidarity against the killing of the Tolupanes in Yoro, caused by the occupation of their lands by cattle. The authors of this sinister plot paid $500 for each human head. This practice is an indicator of the extreme racism in Honduras and that the hired killers have always been a normal tool in the hands of the powerful. I remember Tacamiche, to cite one of so many violent evictions in Honduras. In July of 1995 close to 500 people who had been living since the middle of the century on lands abandoned by a branch of the North American business Chiquita Banana were evicted by the Honduran military. The symbolic cost of these lands for the banana company was one dollar. To evict the peasants they launched hundreds of teargas bombs. We attended boys and girls who were burned and several women aborted because of exposure to the toxic gases. They destroyed the health centre, the Church School, and the corn and bean fields. The five hundred evicted people were relocated in a building with just one bath and one bathroom. If we ask ourselves who are those who have been dispossessed of their lands and of the waters by the mining, banana, shrimp and wood companies and the plantations of African Palm for agro fuel, it is the original peoples, the Garífunas, the Misquitos and the peasants. They are the ones who make the land produce, who live in pauper conditions, and those who have the worst conditions of health, education, potable water and housing. Based on these historical antecedents, we appeal to unity, organization and mobilization of the local national and world conscious with the objective of stopping the machinery of geopolitical, ideological and anti-human war against the peoples of Latin America. 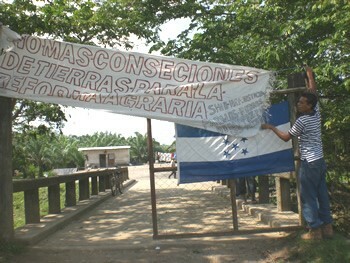 In Bajo Aguán, in Honduras, plans for a peasant massacre are being developed. The demand for delegations, economic solidarity and every type of humanitarian support for the families of the Unified Peasant Movement of Aguán (MUCA) is an urgent message. The violence screams in every sweaty pore of the peasant and the system buys the consciousnesses to hide the truth. To defend at all costs the life of humans and of the planet should be our mission. In this small country, with an oligarchic system and an army of international capitalism the multimillionaire plans for proliferation of military bases, media campaigns and growing multimillionaire religious and media fundamentalism against Cuba, Venezuela, Ecuador, Bolivia, Nicaragua and the suffering people of Colombia are reflected. They are rehearsing and experimenting with a war in Honduras that begins against the peasantry and the original and Garífuna peoples. It is the power of the arms business and the buying of consciousnesses against the process of liberation and historic dignity of the peoples of Latin America. We celebrate the strength of the spiritual and cultural unity of the resistance of the peoples of the world against pain and suffering. Our ethical and libratory commitment should be to such a degree that with the slightest showing of injustice, the subtle flight of the hummingbird moves us and invites us to defend dignity and life.